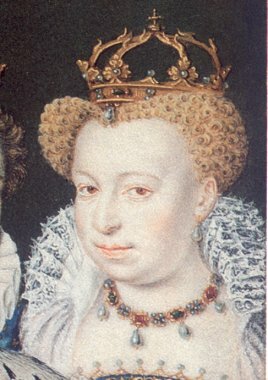 Catherine of Valois, was the youngest child of Charles VI of France and Isabelle of Bavaria. She was born on October 27, 1401, at the Hotel de St. Paul in Paris during her father's period of insanity. Catherine was almost entirely neglected during her childhood due to her father's frequent bouts of insanity and her mother's selfish indifference. While the king was ill, her mother joined the king's brother, the Duke of Orleans, in pilfering the revenues of the household. When Charles recovered, Isabelle fled with he Duke of Orleans to Milan, followed by her children, who were pursued and brought back by the Duke of Burgundy. was in France. The queen joined her husband in Paris in 1422, leaving her infant son in England, and was with him when he died at the castle of Vincennes, in August 1422. She returned to London and resided first at Windsor Castle then at Baynard's Castle, London. Some years later Catherine married Owen Tudor, an officer of Welsh descent, who was clerk of the queen's wardrobe. This marriage was kept secret for several years because English Parliament forbade her marriage without consent of king and council. They had three sons and two daughters, one of which died in infancy. While they lived together, Catherine was a devoted mother and wife and lived very happily. In 1436, when the marriage was found out, Owen Tudor was imprisoned and Catherine was removed to Bermondsey Abbey, London. Being torn from her children was an act of cruelty that probably hastened her death. Catherine died in the care of pious nuns who did their best to comfort the Queen in her last days. Patricia Chadwick is a freelance writer and has been a stay-at-home mom for 15 years. She is currently a columnist in several online publications as well as editor of two newsletters. Parents & Teens is a twice-monthly newsletter geared to help parents connect with their teens. Subscribe at www.parentsandteens.com. History's Women is weekly online magazine highlighting the extraordinary achievements of women. Subscribe at www.historyswomen.com/subscribe.html.